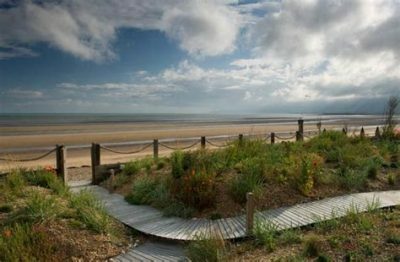 Living by the sea, has many advantages, bracing walks and fine views amongst them, but many find gardening in exposed coastal areas a challenge. But it is still possible to have a garden, that can be fully enjoyed and planted with dramatic planting. Here are some plants that cope well with salt laden winds and the hash environment of the sea side garden. Hippophea rhamnoides: This is a hardy deciduous upright shrub, that lives up to it’s common name of ‘Sea Buckthorne’ .It can become a large shrub or even a small tree and is ideal as a first defence against sea winds. It has an open habit, with thorny dark brown branches and narrow sliver leaves. 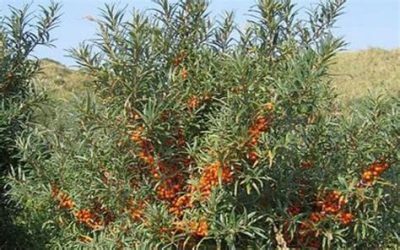 Late summer clusters of small round orange berries are produced along the branches and persist long into winter. Will tolerant most soils, but is not keen on waterlogging. 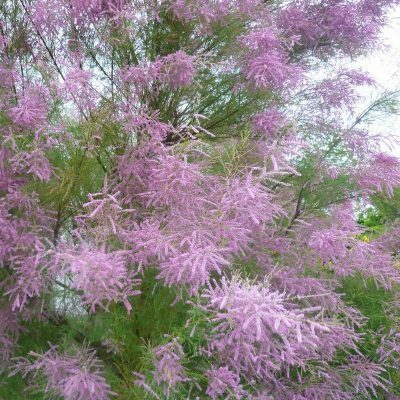 Tamarix ramosissima Rubra: This seaside classic, produces a large upright shrub with slightly sprawling habit. It has fine mid green foliage borne on shiny brown branches and is deciduous. It is covered in fluffy pinkish red sprays of flowers from August into September. It copes well with sea winds and again is a good shrub to plant around the boundaries of your seaside garden. Grows on most free draining soils, sunny aspect. 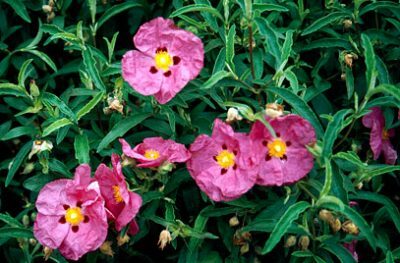 Cistus x purpurea: This beautiful medium sized evergreen shrub, grows into a mound of aromatic grey green foliage which is slightly sticky to the touch. It produces large pink/purple saucer shaped flowers. Bourne freely from June to July. It does well in seaside gardens and can cope with sea winds. Grows in any free draining soil. Full sun. 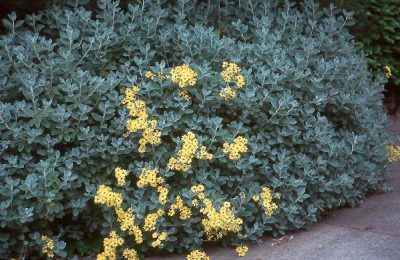 Brachyglottis (Senecio) ‘Sunshine’: This is a must have for any coastal garden, with it’s ability to cope with sea salt and strong winds. A low growing evergreen shrub with a mound habit but happy to spread. Of sliver slightly furry leaves, and clusters of brilliant sunshine yellow daisy like flowers from June to September. Good free draining soil. Full sun. 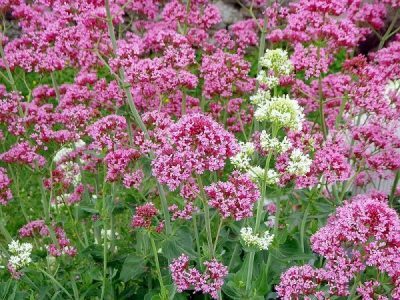 Centranthus ruber: No seaside garden would be complete with out this very pushy and hardy herbaceous plant, it will grow almost any where and with only the merest suggestion of soil, from cracks in the pavement to on shingle banks at the top of the beach. Some may consider it a weed, but a very stunning one it is. Upright growth of mid green with almost succulent mid green leaves, and pink/red wide heads of clustered small flowers freely borne from May up to the first frosts. It is not that long lived, but as it seeds freely, it will always be present. Sunny position, free draining soil. Eryrigium maritimum: ‘Sea Holly’ A stunning statement herbaceous plant for any coastal garden. Mid green, and sliver spiky leaves make a base pad from which tall branches of stems with smaller spiky leaves almost like brats emerge, Small multiple thistle like flower heads appear from July, the stems below and flowers turning a silvery blue. The colour and thistles will last into late summer. Full sun, free draining soil. the very best of seaside planting. These plants will cope well in seaside sites, the trick of planting by the coast is to layer your planting and get good planted wind barriers in place to help protect some areas of the garden, this can of course be a bit of a challenge if you still want your sea view as well. 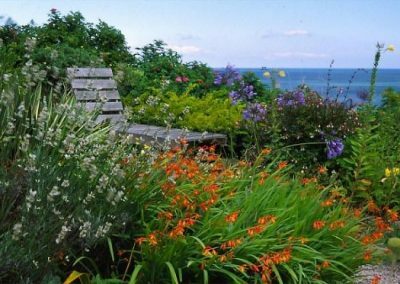 But it is possible to have stunning seaside gardens and great views and even the odd nock out of the wind as a spot to have a patio and garden bench. I hope this has inspired you to think of the potential of your coastal garden. If you need help to create your seaside garden then do give me a ring Tel:01273 470753. I would be delighted to discuss your garden project with you. 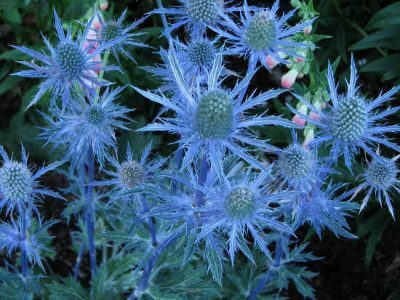 This entry was posted in Gardening News, Gardening Thoughts and tagged coastal plants on July 4, 2018 by Emily.